Opening Hours: daily (to be confirmed). Decorated by Tom Binns (Project Manager). Dmytro Morykit plays one of his tango pieces as Catherine & Wim from Tango Tipica practice a dance in the foyer of the Concert Hall. 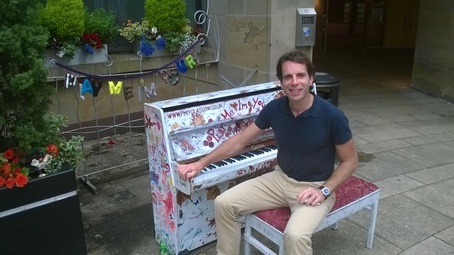 Dmytro Morykit was on his way to the Royal Conservatoire of Scotland, when he came across the piano waiting to be played to an empty room - he had to do it. Jonny Livingstone . 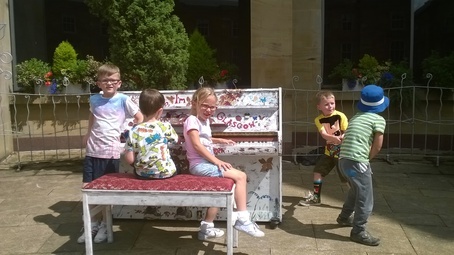 . . making the most of the piano on the top steps. Jonny Livingstone at the concert hall. 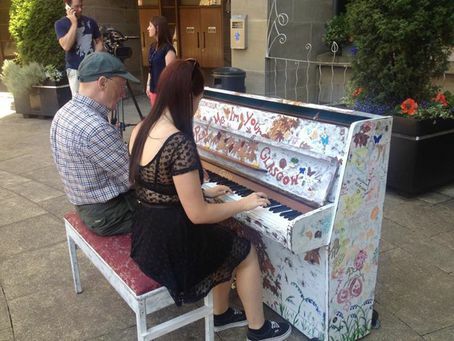 A duet at GCRH on one of the Pop-up pianos during a day when pianos were alive throughout the building. Graeme Stokes and Karen Long with a wee chopsticks duet on the concert hall steps while STV News are filming. Mark Beaumont signing ' Calisia ' on the Concert Hall Steps just before the Queens Baton arrived. Andy Gall playing it by ear on the Concert Hall steps just before the Queens Baton arrived.
' Calisia ' the piano . . . on the top steps of the Concert Hall. No need for a scrap lads . . . you can all have a shot when the rest of the weans are done !